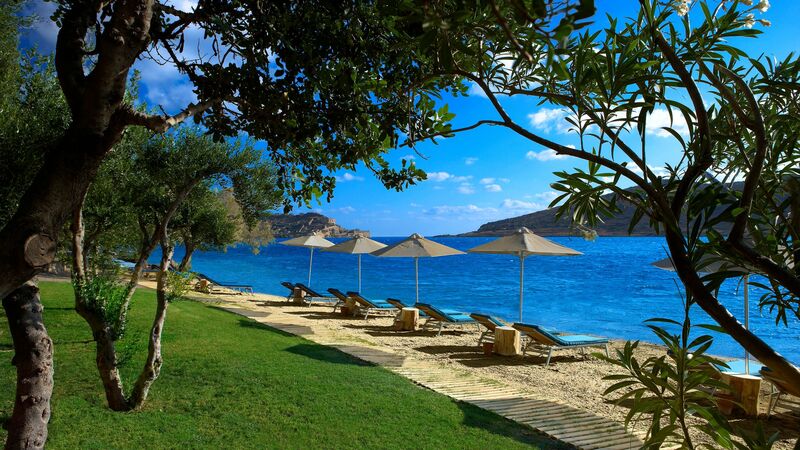 The Domes of Elounda is the perfect place for a luxury family trip. Stunning views will leave you in awe and the warming aura will leave a lasting imprint on you. It is one of those picturesque destinations. Located on the hillside of Spinalonga island, which is topped by a helicopter pad, you will be presented with the perfect spot for relaxation and rejuvenation. Take a sailing trip together or a go mountain biking to experience the beauty and adventure in this incredible location. On arrival at the Domes of Elounda, you will be whisked away to your Art Deco style accommodation which includes amazing suites and villas, and gold washbasins. 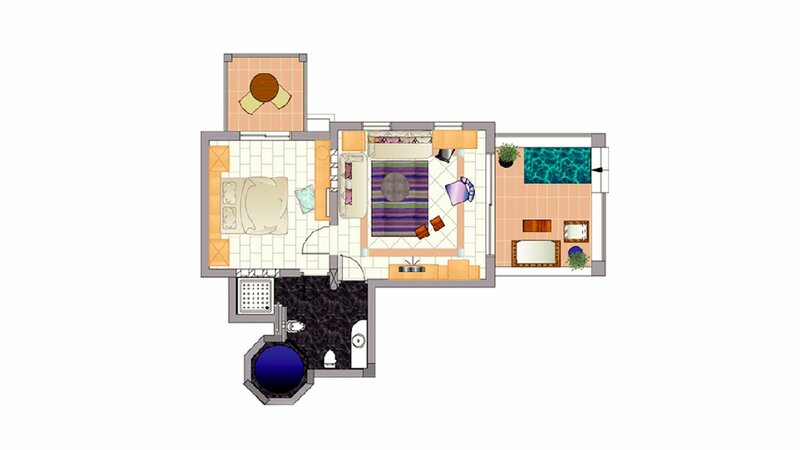 Luxury suites have hot tubs and amenities which will suit the whole family. The Kids’ Club, outdoor theatre and non-stop activities provide your children with plenty of fun, while you can also play together on the private sandy beach with shallow waters. Lavishly unwind in the pool as your children make a splash in the separate swimming pool before enjoying the delicious luxury food and fine dining in elegance as you overlook the crystal waters. The hotel is perfect for both couples and families with family focused activities, as well as superb adult only areas. Enjoy a candlelit dinner next to the pool or a bottle of fine wine on the balcony. It is perfect for a wedding too, with a choice of romantic settings. The hotel has 78 suites and 40 villas. Dine in the authentic surroundings of this luxury Italian restaurant, praised for its incredible menu. There is an exceptional wine selection and an incredible steak and lobster evening. The dress code is casual during the day and smart casual in the evening. No swimwear is permitted in the restaurants. Gentlemen are requested to wear Bermuda shorts or trousers. Guests on half board receive a credit towards dining at this restaurant. An award-winning and enchanting à la carte seafood restaurant, this is the best place to enjoy delicious seafood underneath an olive grove by the sandy beach and blue sea. The dress code is casual during the day and smart casual in the evening. No swimwear is permitted in the restaurants. Gentlemen are requested to wear Bermuda shorts or trousers. Guests on half board receive a credit towards dining at this restaurant when à la carte dining is available (cannot be used towards special events and themed evenings). 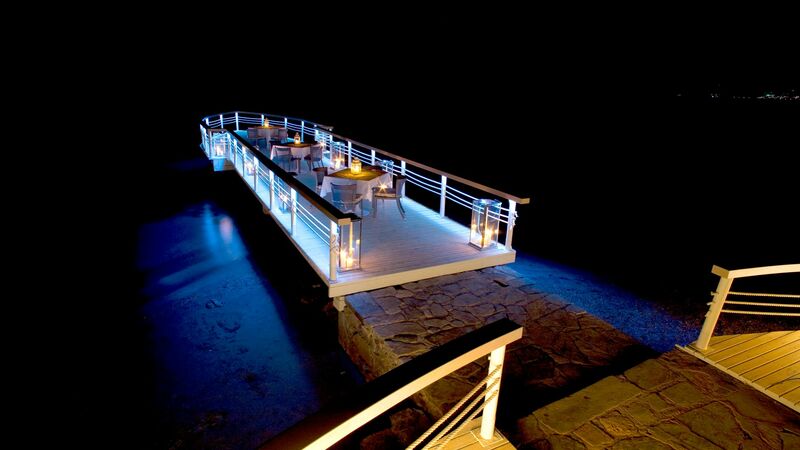 Dine in the cosy dome shaped restaurant surrounded by the view of Spinalonga and the turquoise waters. There is Mediterranean and multicultural cuisine available, including a delicious breakfast buffet. Meals are available for half board guests. There is also a special section just for children. The dress code is casual during the day and smart casual in the evening. No swimwear is permitted in the restaurants. Gentlemen are requested to wear Bermuda shorts or trousers. An attractive bar and restaurant with fine Japanese-Peruvian dining. 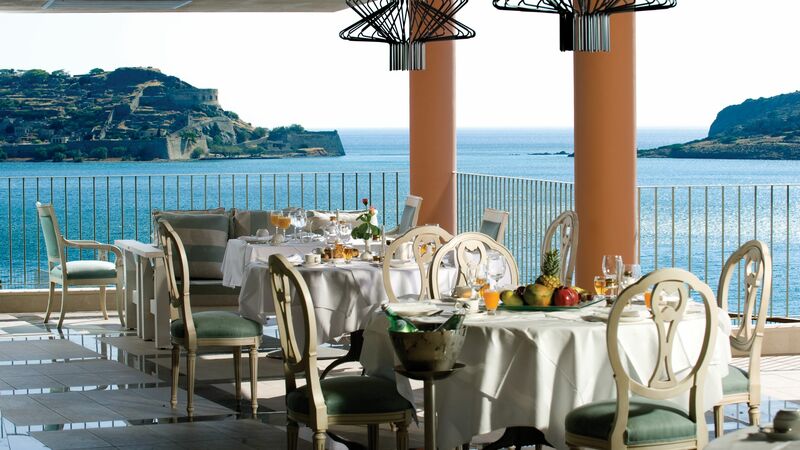 You’ll taste exotic flavours in character beside Spinalonga Castle. Open: Pool bar 10:00-18:00, Main restaurant 09:30-11:30, 12:30- 17:00 and 18:30-22:00. Closed Saturdays. The hotel has its own stretch of private sandy beach offers where you can enjoy shallow, calm waters perfect for little ones. There are also sun beds and umbrellas, as well as water sports. Activities include wind surfing, scuba diving, water skiing, canoes and pedalo rides. There are four swimming pools to choose from: an 800m2 family pool (heated to 26˚C in Low Season), a heated smaller pool and pool bar, and a smaller shaded pool for children. There are wonderful views of stunning Spinalonga island from the adults only pool. 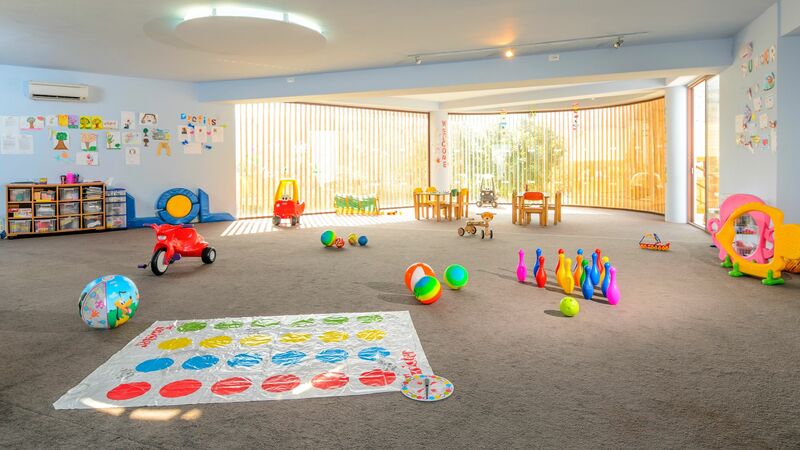 Enjoy a relaxing day by the adults-only pool or at the spa while your children are looked after by the excellent and professional staff in the creche. Open: 10:00-13:00 and 15:00-18:00. Closed on Sundays. On request, local babysitting services are also available in the evening and pre-booking is recommended due to limited spaces. 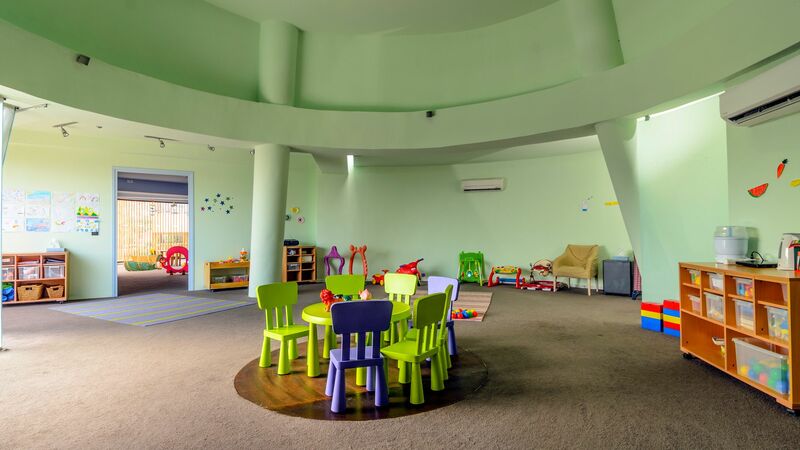 The club is run by a professional and Ofsted approved childminding company and is free for guests. From the pool to the outdoor amphitheatre, your children will have never ending fun. 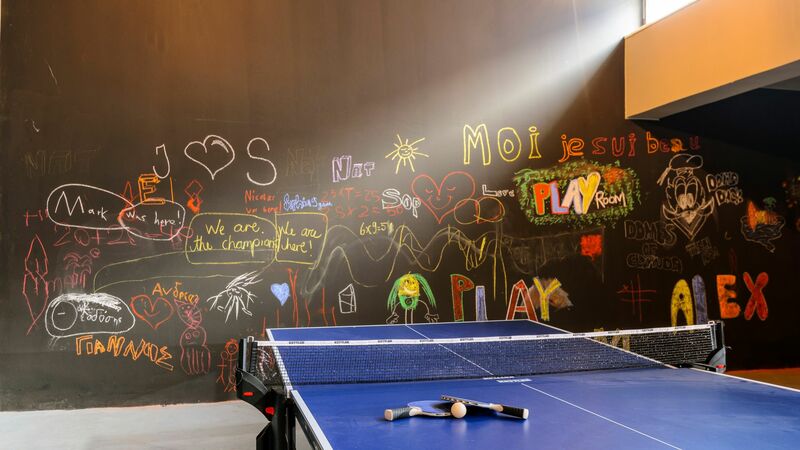 Facilities include table tennis, table football and the latest Xbox games. Both teens and kids can enjoy biking lessons, drawing lessons, swimming, and water sports. 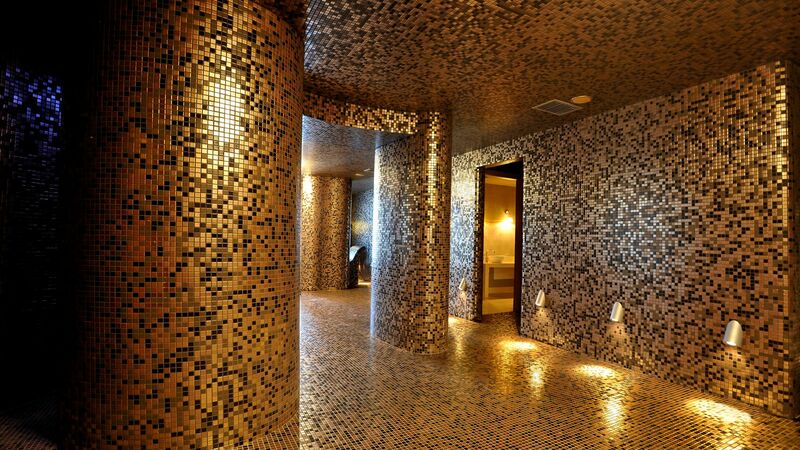 The luxury spa offers an ideal setting where you can unwind in the indoor pool, sauna and steam bath. Massage treatments include the resort’s signature therapy which uses local Cretan herbs. Reservations are required. There are also treatments available for children. Stay fit in style with the highly advanced facilities and new machines available at the Domes of Elounda. Personalised services include personal training, yoga and aquatic lessons. There are both indoor and outdoor fitness zones. The Core is a multifunctional area where guests can enjoy a range of art, design, fashion, wellness, culture, gastronomy, music and entertainment. It features pop-up stores, food trucks, open air festivals and exhibitions as well as an outdoor cinema, playground, sports facilities and areas to enjoy peach and relaxation. There is one tennis court for guests with equipment provided by the hotel. Private lessons with an expert coach can also be arranged. Domes of Elounda can be found on Crete’s north east coast, close to Plaka’s pebbly beach and crystal clear waters. Spend your days on the beach, trying some of the water sports, or soaking up the atmosphere in the traditional town of Plaka. Take a boat across to Spinalonga Island and take in its history as a former leper colony or visit the historic fort. 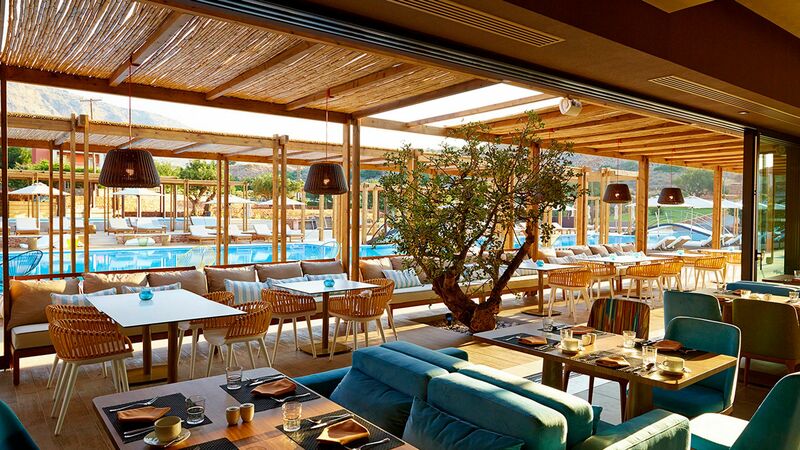 Elounda is close by and ideal for those wanting to enjoy a lively atmosphere. Here you’ll find a further selection of shops, bars and restaurants, as well as a golden sandy beach which sweeps around the bay. Visit the windmills for a picturesque sight, or drive further along the coast to Aghios Nikolaos where you can admire colourful Venetian architecture and a beautiful lake. 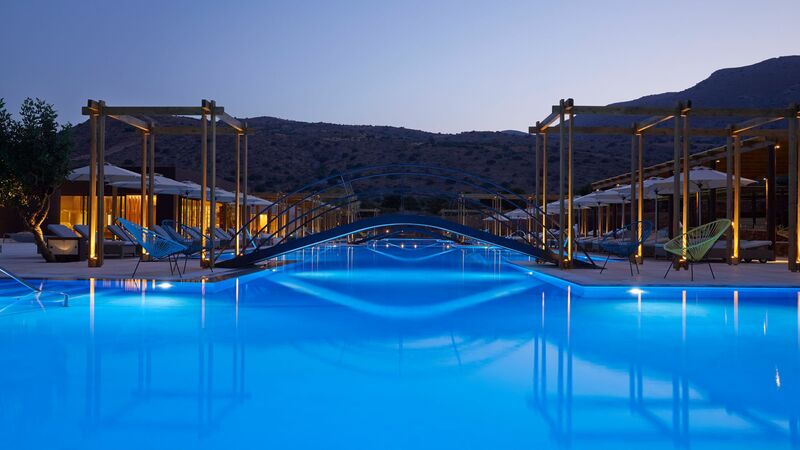 Domes of Elounda is an hour and 10 minutes’ drive away from Crete Heraklion Airport. These spacious suites consist of a bedroom with queen size bed and a separate living area with a single sofa bed suitable for a child. A large balcony or terrace is furnsihed with a heated Jacuzzi® and offers views views over the gardens. Enjoy the superb amenities of these spacious suites with the added benefit of stunning views over the Gulf of Elounda or island of Spinalonga. These exceptional suites boast a lovely private seawater pool on the spacious terrace that looks over the Gulf of Elounda or Spinalonga. 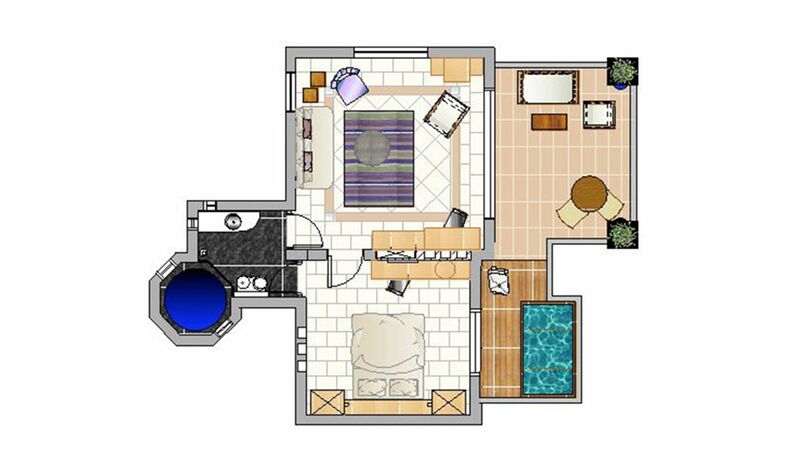 Family Suites offer plenty of space for a family of four with a master bedroom, a separate living room with two sofa beds and a balcony or terrace with outdoor heated Jacuzzi® and garden views. Children's bathrobes and slippers are also provided. These rooms are as above but benefit from sea views from the spacious terrace. Enjoy your own private seawater pool with views over the Gulf of Elounda of Spinalonga, as well as all the amenities expected from the Family Suites. These fantastic suites are perfect for families wanting their own space, with a well-furnished living area, two bedrooms (one with a queen size bed and the other with two twin beds), two en suite bathrooms and a large balcony or terrace with outdoor furniture and a whirlpool. These exquisite Private Residences feature two bedrooms, one with a queen size bed and one with twin beds, two bathrooms, living room and a fully equipped kitchen. A lovely private garden boasts an individual seawater pool. Guests of these villas are entitled to upgraded services including a dedicated villa manager, in-villa dining and a complimentary use of the club car. Domes Private Residences, Luxury Residences and Domes Luxury Villas benefit from the Haute Living Selection, for uncompromising elegance and tailor-made services. Services include: a dedicated villa manager, 24/7 concierge, in-villa open bar upon arrival, an exclusive mobile phone with one-button access to the villa manager and room service manager, in-villa check-in, pre-booked sun loungers at the VIP area of the beach, delivery service of grocery list, upgraded welcome and bathroom amenities and pillow menu selection. Guests will also receive complimentary 24/7 access to the Haute Living Room where they can enjoy gym facilities, on-the-go massages, a range of cocktails and spirits, afternoon tea, signature canapés, express check-in and check-out, high speed WiFi and a lounge area with magazines, tablets and books. For a supplement, on request services also include in-villa signature dining, dedicated butler service and exclusive crèche services. These residences have two bedrooms with queen beds and one bedroom with twin beds, along with two bathrooms, living room, fully equipped kitchen and a private garden with seawater pool. These luxury boutique villas offer private and spacious accommodation of the highest standard with state of the art furniture in the living area and bedrooms. These villas feature a large living area, a master bedroom with queen size bed and a second bedroom with twin beds, two marble bathrooms and an outdoor space with a 50m² private fresh water pool. These villas have a sea view. The sunlit living area has oversized windows offering stunning views of Crete's imposing landscape. Guests also benefit from the facilities and services of the Domes Plaza including an 800m² swimming pool, an exclusive Resident's Restaurant and Resident's Bar, a private concierge/lobby area and a mini market/delicatessen. The pool can be heated for a supplement, please note that the temperature may vary depending on the outside air temperature. Domes Private Residences, Domes Luxury Residences and Domes Luxury Villas benefit from the Haute Living Selection, for uncompromising elegance and tailor-made services. Services include: a dedicated villa manager, 24/7 concierge, in-villa open bar upon arrival, an exclusive mobile phone with one-button access to the villa manager and room service manager, in-villa check-in, pre-booked sun loungers at the VIP area of the beach, delivery service of grocery list, upgraded welcome and bathroom amenities and pillow menu selection. Guests will also receive complimentary 24/7 access to the Haute Living Room where they can enjoy gym facilities, on-the-go massages, a range of cocktails and spirits, afternoon tea, signature canapés, express check-in and check-out, high speed WiFi and a lounge area with magazines, tablets and books. For a supplement, on request services also include in-villa signature dining, dedicated butler service and exclusive crèche services. These luxury boutique villas offer private and spacious accommodation of the highest standard with state of the art furniture in the living area and bedrooms. 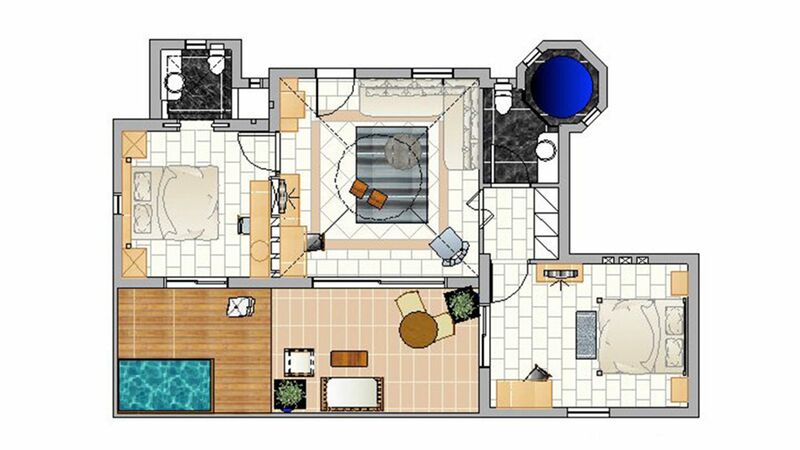 These villas feature a large living area and three bedrooms, as well as a fresh water pool. Guests also benefit from the facilities and services of the Domes Plaza including an 800m² swimming pool, an exclusive Resident's Restaurant and Resident's Bar, a private concierge/lobby area and a mini market/delicatessen. The pool can be heated for a supplement, please note that the temperature may vary depending on the outside air temperature. Domes Private Residences, Domes Luxury Residences and Domes Luxury Villas benefit from the Haute Living Selection, for uncompromising elegance and tailor-made services. Services include: a dedicated villa manager, 24/7 concierge, in-villa open bar upon arrival, an exclusive mobile phone with one-button access to the villa manager and room service manager, in-villa check-in, pre-booked sun loungers at the VIP area of the beach, delivery service of grocery list, upgraded welcome and bathroom amenities and pillow menu selection. Guests will also receive complimentary 24/7 access to the Haute Living Room where they can enjoy gym facilities, on-the-go massages, a range of cocktails and spirits, afternoon tea, signature canapés, express check-in and check-out, high speed WiFi and a lounge area with magazines, tablets and books. For a supplement, on request services also include in-villa signature dining, dedicated butler service and exclusive crèche services. These luxury boutique four bedroom villas offer private and spacious accommodation of the highest standard with an unrivalled amount of space. The villas feature a large living area, two bedrooms with a queen size bed and a two bedrooms with twin beds which can be converted to double beds, all the bedrooms have an en suite marble bathroom and there is a wooden decked outdoor space with a 55m² private fresh water pool, whirlpools and waterfalls offering a tranquil and private area. The sunlit living area has oversized windows offering stunning views and the villas have a sea view. Guests also benefit from the facilities and services of the Domes Plaza including an 800m² swimming pool, an exclusive Residents' Restaurant and Residents' Bar, a private concierge/lobby area and a mini market/delicatessen. The pool can be heated for a supplement, please note that the temperature may vary depending on the outside air temperature. Domes Private Residences, Luxury Residences and Domes Luxury Villas benefit from the Haute Living Selection, for uncompromising elegance and tailor-made services. Services include: a dedicated villa manager, 24/7 concierge, in-villa open bar upon arrival, an exclusive mobile phone with one-button access to the villa manager and room service manager, in-villa check-in, pre-booked sun loungers at the VIP area of the beach, delivery service of grocery list, upgraded welcome and bathroom amenities and pillow menu selection. Guests will also receive complimentary 24/7 access to the Haute Living Room where they can enjoy gym facilities, on-the-go massages, a range of cocktails and spirits, afternoon tea, signature canapés, express check-in and check-out, high speed WiFi and a lounge area with magazines, tablets and books. For a supplement, on request services also include in-villa signature dining, dedicated butler service and exclusive crèche services. Luxury Villas are beautifully designed over a multi-level layout and offers the utmost is luxury and comfort. Guests can relax on the villa's spacious terrace or take a swim in their own private seawater pool whilst enjoying the stunning views of the bay of Elounda and Spinalonga. The villa features all the modern amenities guests will need to ensure they have a memorable stay. The pool can be heated for a supplement and 2 days notice is required. Please note that the temperature may vary depending on the outside air temperatures. Luxury Villas will benefit from the Haute Living Selection, for uncompromising elegance and tailor-made services. Services include: a dedicated villa manager, 24/7 concierge, in-villa open bar upon arrival, an exclusive mobile phone with one-button access to the villa manager and room service manager, in-villa check-in, pre-booked sun loungers at the VIP area of the beach, delivery service of grocery list, upgraded welcome and bathroom amenities and pillow menu selection. Guests will also receive complimentary 24/7 access to the Haute Living Room where they can enjoy gym facilities, on-the-go massages, a range of cocktails and spirits, afternoon tea, signature canapés, express check-in and check-out, high speed WiFi and a lounge area with magazines, tablets and books. For a supplement, on request services also include in-villa signature dining, dedicated butler service and exclusive crèche services. Luxury Villas oozes style and elegance with many specialist features including handmade furniture and hand-picked fabrics. The villa is split over three levels and has 3 bedrooms and 3 bathrooms which are all designed in either marble or granite. The private seawater pool and terrace give breathtaking views of the ocean, Gulf of Elounda and Spinalonga. Offering the ultimate in indulgence, the villa has its very own spa including a sauna, heated lounge chair and indoor and outdoor spa treatment capabilities. The pool can be heated for a supplement and 2 days notice is required. Please note that the temperature may vary depending on the outside air temperature. Save up to 10% on the hotel price for holidays between 17 - 30 April 2019. Save 15% discount between 01 - 24 May 2019 and 23 September -31 October 2019. Save 20% discount between 01 - 22 September 2019. The above offers are valid for bookings made by 02 May 2019 with a minimum stay of 5 nights required. Save an additional 5% discount, courtesy of Sovereign for holidays between 17 April - 31 October 2019 when staying in a Domes Luxury Residence or Domes Villa accommodation. Valid for bookings made by 02 May 2019 (a minimum stay of 5 nights is required). Save an additional 5% discount, courtesy of Sovereign for holidays between 17 April - 31 October 2019 (a minimum stay of 5 nights is required). Applicable when staying in Premium Suites and Family Suites when staying a minimum of 5 nights for holidays between 17 April - 31 October 2019. Guests receive daily buffet breakfast and evening buffet dinner served in buffet restaurant (drinks excluded, kids buffet and early family dining available). Guests that wish to Dine Around can enjoy à la carte dining at Yaosai, Blend or Topos 1910 restaurants by receiving a 15€ allowance for adults and a 7.50€ allowance for children. Applicable when staying in Domes Private Residences, Domes Luxury Residences and Domes Luxury Villas for holidays between 17 April - 31 October 2019. Guests receive daily buffet breakfast in the Blend Restaurant and can choose to dine around in any of the hotel’s 4 restaurants, Tholos, Yaosai, Topos 1910 & Blend daily and enjoy a 3 course a la carte dinner (some items are excluded from the la carte menu / drinks not included). The dine around program cannot be used during special events (BBQ evening) however guests can use a 15€ credit allowance for adults and a 7.50€ credit allowance for children as to participate to special evenings. Complimentary Kids Upgrade to Full Board when staying with two Full Board paying parents for Holidays between 17 April - 31 October 2019. Guests staying in all Residence and Villa room categories receive free Eco Pool heating for holidays between 17 April - 04 June 2019 & 20 September - 31 October 2019 (a minimum stay of 5 nights is required). Book with Sovereign and enjoy all of the following complimentary holiday experiences which are included in your stay at Domes of Elounda. Guests can experience one complimentary traditional Cretan wooden boat (kaiki) trip per person per stay around the Bay of Eland, enjoy the Cretan landscape seen from the sea, have a swim in the emerald waters of Eland and sail around the UNESCO protected islet of Spinalonga. Guests can participate in a Greek cooking lesson using fresh local organic ingredients and transforming them into simple fresh tasty Cretan dishes. Guests receive one Greek seafood à la carte dinner per person per stay in the renowned Topos 1910 (3 courses meal excludes drinks). The above experiences are offered once per person per stay and are subject to terms and conditions. A minimum stay of 5 nights stay is required and experiences are organised on set days and times which can be canceled due to weather conditions etc., alternative experiences will be offered in the event of any cancellations (cash value will not be offered to guests in exchange for any experience). Couples receive the following benefits for holidays between 01 - 24 May and 01 September - 15 October 2019. Access to Blend Privé, the brand new adult’s only area of Blend Restaurant for complimentary aperitifs and canapes (daily from 18:30 until 19:30). Honeymooners receive one chilled bottle of sparkling wine, selection of fresh seasonal fruits, traditional Greek sweets, first breakfast served with fresh flowers, one supervised Domes Spa Thermae Experience per couple and decoration of room with flowers and rose petals on the bed on arrival for holidays between 17 April - 31 October 2019 (a minimum stay of 5 nights id required, wedding certificate must be presented with hotel confirmation). Free delivery service for ordering grocery or other daily necessities. This place is a true paradise, we were upgraded to 2 bedroom villa with our own large pool. Breakfast buffet to die for/ excellent staff. Beach lovely and so many pools to choose from though we had our own. The place is huge with olive trees around. the villas have large bedrooms, with high quality furnitures and bedroom sheets. Large bathrooms with marble and rain showers, toiletries are made with olive oils which are abundant in the area. Simply spectacular place to be. I simply loved the Domes of Elounda! I was after a short break to relax and this was the perfect place for it. I booked a one bedroom suite with a sea view and a balcony with a whirlpool! The room itself was very spacious. The bathroom with a large jetted tub had doors connecting it to the bedroom on one side, and to the living room on the other, in the event that the sofa bed is being used. The view from the balcony, particularly at sunrise on a clear day is spectacular! As others have mentioned, the resort is built on a steep hill although buggies are readily available to take you to and from your room. From the main reception and pool area you can walk via a short underpass to the beach across the road, which is where Topos, the seafood restaurant is located. Perfect dining by the beach. There are three other restaurants - Tholos, where breakfast is served, Yaosai, the Japanese restaurant by the main pool and Blend, the Italian restaurant located on the opposite side of the resort where the residences are. Overall, service at the hotel was excellent. The dining options were good both in product and service. Breakfast was varied although when it got busy, things did slow down a bit. The property attracts a lot of young families, particularly around U.K. school holidays. You need a car to get to the hotel from Heraklion Airport which is approximately over an hour?? ?s drive away. The boats to Spinalonga island depart regularly from Plaka Marina - definitely worth a visit. Elounda and Aghios Nikolaos are also worth visiting once there. I can?? ?t wait to return! 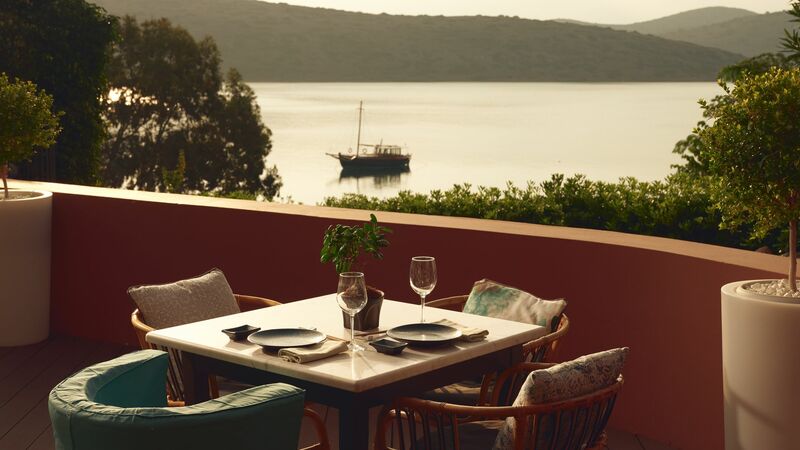 As far as 5 star luxury family friendly resorts go, Domes of Elounda is definitely up there without a doubt. Since having twins our holidays have definitely been different (as all parents know!) but it?? ?s incredibly important for us as a family to enjoy a break in the sunshine and for Mum and Dad to return feeling rested and as refreshed as one can with 2 6 year olds! With this in mind we do invest in our holidays ??? and Domes of Elounda is not a cheap option so we were expecting 5 star. Location: Crete is a truly beautiful island and the hotel really is perfectly positioned with the most amazing views of Spinalonga Island. Like many of the reviews have mentioned, it is very hilly around the resort but regular club cars zip around so no worries about packing your hiking boots! The walk back from the beach is quite steep however so do check with the hotel before you book if any assistance can be provided for those with mobility challenges. Split into 2 main areas: the private and luxury residences/villas, main pool, Blend Restaurant and Haute Living lounge and then the other location included the suites, main reception, 3 restaurants and beach. You did need to take a club car between the 2 locations (unless you were feeling fit and energetic!) Staff: Wow ??? what an amazing team here. Everyone was incredibly professional, friendly and hard working and made it their mission to ensure guests were comfortable and enjoying their holiday. Each and every person that worked here is a real credit to the resort and I cannot praise highly enough. Thank you to the wonderful Hotel Manager Mr Seizis who was always seen around the resort, chatting to guests and I can?? ?t recall everyone?? ?s names unfortunately, but a few individuals who really went above and beyond include the wonderful F&B Manager Kostas, Alex, Thomas, Ross, Lia, Elena & Kiki in Blend, Georgia, Nicholas, John & Eleni in Haute, AJ & Thanasis at the beach, Dimitris and Lefteris in Yaosai and the lovely Nicoletta and her housekeeping team. Accommodation: We stayed in a 2 bed Private Residence with our own pool ??? refurbished this year and benefitting from the Haute Living concept. The villa was beautifully situated with fantastic views. They were clean and nicely decorated. Housekeeping staff were amazing. From a design perspective however we felt that the huge balcony on the first floor was a wasted space particularly when some of the villa interior was a little cramped (e.g. downstairs bathroom where door could not open fully). I do know that as the refurbishment is recent, the accommodation is still being fine-tuned and plans to install Jacuzzis on the balconies are being considered. Would definitely be a great addition! Haute Living Concept: A real positive for the resort and a new concept for this year ??? we really enjoyed the Haute experience and the Guest Relations team were fantastic. Being able to ring for a club car direct to our villa was great ??? especially when we had the unseasonable rain one eve before heading out for dinner! The lounge itself was spacious and was great to have food and drink available; 24 hours if required. When speaking to the team, the HL concept is still evolving and there was some confusion with guests over availability of spirits in the HL package which did need to be made clear. Essentially food and wine was available at all times and spirits were available to be enjoyed as a pre-dinner aperitif but for after dinner, spirits and cocktails available at the main bar. Small observation, but some guests did appear disgruntled as they thought that their spirit consumption was being policed! Pools: Hotel has a main family pool, adults only pool and very small ?? ?baby pool??? (too small for the size of resort in my opinion). We did notice that all the pools with the exception of the tiny baby pool, had a standard depth through of 125m. For our children that can swim but not strong swimmers this wasn?? ?t great as we had to put armbands on them at all times (which they hated!) as they couldn?? ?t touch the bottom anywhere. Of course we were in the pool with them, however a gradient on depth would have been much more ?? ?family friendly?? ?, especially in the kids pool. After speaking with the hotel, the fantastic news is that a new Kids Pool is being built during the winter in front of the Kids Club. Unfortunately we did have some issues with our private pool discolouring the lining of our swimwear which the hotel took immediate action to try to resolve. A specialist was called in as this had never happened before; it was not harmful or a hygiene issue and I think was down to imbalance of the pool treatments used oxidising. Unfortunately the laundry did not rectify the discolouration. Not something I thought we would experience at a 5 star luxury resort but credit to the team, including the Hotel Manager, who responded best they could to try and resolve the situation and who themselves were upset that this had occurred. Beach: The views from the beach were incredible. Such beautiful scenery and crystal clear waters and the team at the beach were always very welcoming. As guests with the Haute Living package, you are able to benefit from a private part of the beach with a sun lounger reservation system booked through the Concierge. This was brilliant and took the pressure off having to start your morning with a race down to the beach with the children! I did feel as a hotel that prides itself on ?? ?family friendly??? that the beach was geared more around adults. Unfortunately the excellent kids menu was not available beach side ??? we were informed we had to eat at the restaurant Topos if the children required this menu (Health & Safety regs apparently when we raised this). For us (and a few other families we spoke to) the fact that only adult meals were available beach side really was an inconvenience and disrupted what would have been a leisurely morning and lunch down at the beach before returning back to the villa/kids club for the afternoon. I do understand from the team that they are looking at revising the menu for next year so that there are some options on the beachside menu that children can enjoy if you prefer to have a quick snack from your sunlounger or the beach bar and not a formal sit down lunch. The hotel did also tell me that there are plans for a children?? ?s area by the beach with buckets and spades. Once our kids had paddled in the sea a few times they were itching for the next activity so this would be a welcome addition and be a nice ?? ?meeting place??? for kids to make friends and play together. Restaurants: The hotel has a main buffet restaurant, Tholos, in addition to 3 a la carte, available with the dine around half board option. Blend (Italian) and Topos (traditional Greek menu beachside) were fantastic. Great ambience, welcoming staff and incredibly delicious food. Yaosai (Japanese/Peruvian) was an interesting mix of dishes, but very tasty and great service again The Kids Menu that ran throughout the resort restaurants was fantastic ??? great choices. On our first night we dined at Tholos buffet restaurant and as first impressions go I would rate our experience as 3 star. In fairness we only went there on our first night ??? and decided never again! We arrived to chaos and an incredibly noisy atmosphere (I appreciate it was school holidays and a lot of children but we couldn?? ?t even have a conversation). Uncleared tables, cramped super busy buffet area, and a long wait to order drinks and be informed how the buffet system worked. We booked the a la carte restaurants for the remainder of our stay. Thankfully as part of the HL concept, we could have breakfast at Blend which was amazing and a real delight. We did give our feedback and understand that it was Italian theme night which is always popular, but perhaps the hotel should consider limiting the number of guests as peak times. I know from speaking to other guests and some of the staff that Tholos has great feedback in general so if we did return to the hotel I would definitely give the buffet another try! The hotel does have future development plans for a new concept next to the villas for several small street food shops which I think is a brilliant idea and will certainly enhance the dining options available to guests. Kids Club: Operated by Worldwide Kids Company (UK based operating to OFSTED standards) was fantastic. Kids loved going for a few hours after lunch; staff and selection of activities was varied and they made some lovely friends. Overall: A beautiful resort with an incredible team of people who go out of their way to ensure their guests have a great holiday and consistently excelled in customer service throughout our stay ??? true Greek hospitality. Certainly in the school holidays, Domes of Elounda is in the high end price bracket of 5 star ?? ?family friendly??? hotels so I was surprised and disappointed to experience some of the areas where there?? ?s definitely room for improvement on this basis. Despite this, the overarching thing for me and what was evident during our stay is that the hotel does really value and act on guest feedback and has great plans for further developments. First class service from the moment we checked in until our unfortunate day of departure. As a Marriott Platinum Premier member, we received an upgrade and free buffet breakfast each day. The property manager also extended one free night dining at the main restaurant. Throughout our stay, we were treated like royalty by all staff members there. The town of Plaka is only a short walk away. Here you will find fine dining as well as a few shops in the historic quaint fishing village. Day trips - So much to see on the island. I suggest you take the time to explore ruins, take a beach hopping boat trip, explore Spinalonga island, even a day trip to Santorini is possible. Excursions can be arranged by the resort through their knowledgeable staff. Looking forward to returning again this year. I highly recommend The Domes of Elounda.